Last Friday, September 12 was a blast. It was UNO's Real Hottest Girls of 2008 Party held at the A. Venue Hall, Makati City. At around 9pm, we were all lined up, checking our names on the guest book. The entrance was subdivided into 3. One for Celebrities, one for sponsors and one for the general audience. We were lucky enough to have entered the venue first and got a very good spot near the stage. 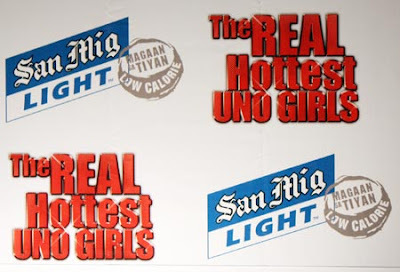 By 10pm, San Mig Lights were served, (for FREE). Sponsors like Citizen's watch started distributing stickers and collecting names for the raffle. There were even racing games like the ones you see on arcades where you can race with a buddy. It was probably around 11pm when the UNO girls started populating the stage. One by one they walked and swayed to the music. And at the center of the stage, they even did a pole dance. Of course camera's were all over the place. From point and shoot to super long dslr lenses. What a sight that was. Some of the notable stars that we were able to get a full glimpse were Priscilla Meirelles, Iwa Moto, Aiza Marquez, Kat Alano, Valerie Concepcion, Arnee Hidalgo, Phoemela Barranda, Malaya Lewandowski and this year's hottest Ms. Ellen Adarna. Raffle came after and luckily, one of the Pinay Celebrity Online team won a Citizen Ecko Watch. Just an observation though. We felt that the Top 10 should have been introduced one by one coz frankly speaking, we're not very familiar with some of them. Also, based on the Updates we had last August 4, seems like only Iwa Moto was on the list. We were a little disappointed not to see Anne Curtis, Khristine Hermosa, Cristine Reyes, Marian Rivera and Heart Evangelista. PS. 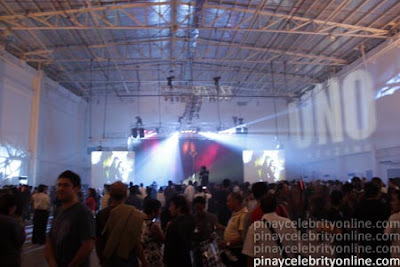 To all Pinay Celebrity Online buddies who also attended the event and have a different set of photos, please send us a copy at webmaster[at]pinaycelebrityonline.com and we'll feature your photos here at Pinay Celebrity Online.